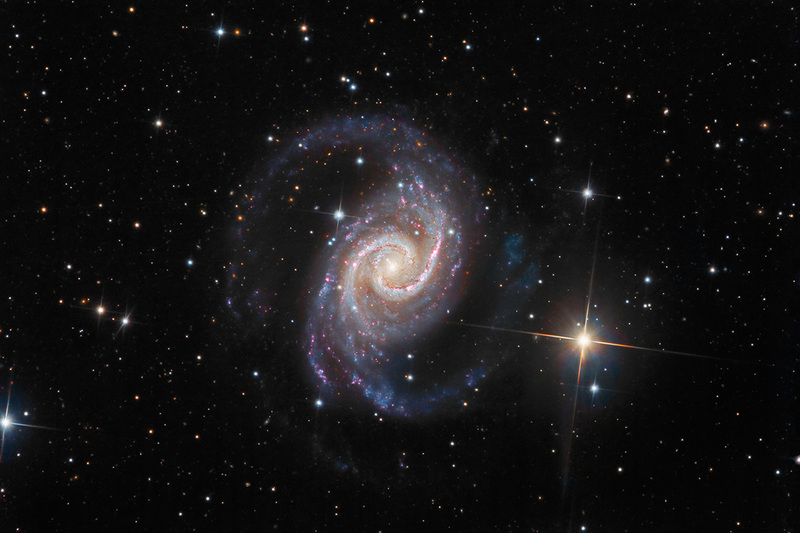 is a ﻿﻿gorgeous﻿﻿, intermediate ﻿﻿spiral ﻿﻿galaxy located some 50,000,000 light-years distance from Earth. Termed 'intermediate' because it lacks a well-defined central bar, it is also the second brightest Seyfert-type galaxy in the heavens. Seyferts actively emit strong radiation bursts from their core. The Spanish Dancer is the dominant member of The Dorado Group, a rich galactic gathering located in the southern hemisphere. Its two symmetrical outer arms are filled with an older population of blueish stars, while new stars are being birthed in the pink HII (hydrogen) knots. This data set from 2014, is the first I have processed from the SSRO ﻿﻿archive.